This authorized history of the Monterey Jazz Festival, while telling the story of a great event, also traces how jazz has changed, for better or for worse, since the 1950s. An appendix listing festival performances and performers from 1958 to 1997 underlines the drama of that change. 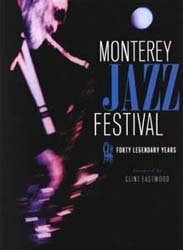 Louis Armstrong, Dizzy Gillespie, Duke Ellington, Miles Davis, Dave Brubeck, Charles Mingus, Gerry Mulligan, Sarah Vaughan, Bill Evans and other major figures dominated the Fairgrounds in Monterey’s first years. They reflected the tastes not only of Jimmy Lyons and Ralph J. Gleason, who founded the festival, but of most listeners who took their music seriously even as they indulged in the party aspects of Monterey that helped make the festival so resounding a success. Beginning in the1960s there was less agreement, even between Lyons and Gleason, about what constituted jazz and who was a jazz artist. And through the years, the number of undisputed giants declining, the Monterey Festival’s bookings reflected ambiguity as the producers fused rock and other offshoots into the mixture. The identity dilemma continues as Lyons’ successor Tim Jackson leads the festival toward a new century, balancing artistic imperatives with commercial demands. Author William Minor blends factors of music, culture, sociology and box office into the tale. He gives insights into the characters who shaped the festival, including Lyons, Gleason, Jackson, Gillespie and festival music directors John Lewis, Mundell Lowe and Billy Childs. He applies an even hand in describing Monterey’s triumphs and its failures. Minor makes it clear that there have been many more high points, like Lewis’ “Three Little Feelings,” Ellington’s “Suite Thursday,” and the 1964 triumph of Charles Mingus, than low points like Spyro Gyra. The writing only occasionally stumbles in thickets of adjectives and adverbs (“the sweet as velour, tart as lemon sounds of Dr. Lonnie Smith”) (“more uniquely”). Nearly 200 photographs, well chosen by Bill Wishner, illustrate the text. Photo credits, unfortunately, are buried in the back of the book rather than appearing next to the pictures. The end paper drawing by David Stone Martin catches the spirit and some of the variety of the festival. Two pages fold out to display 17 color miniatures of Monterey posters. The index is thorough and helpful. Full of anecdotes and performance descriptions, the book is both a good read and a valuable resource.